Children can recreate their own life story with the help of our family stamps. 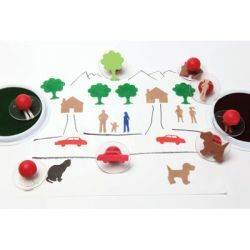 These stamps can be used in a variety of ways such as reinforcing their vocabulary or understanding the dynamics of a family. Stamps have a directional arrow for perfect alignment. This set of 10 stamps includes a father, mother, brother, sister, baby, house, cat, dog, car, and a tree.